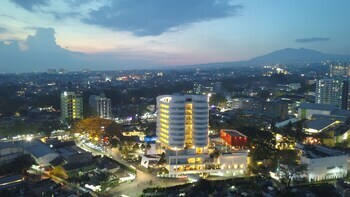 With a stay at Sensa Hotel in Bandung (Cipaganti), you'll be steps from Jalan Cihampelas and Cihampelas Walk. Featured amenities include a 24-hour business center, complimentary newspapers in the lobby, and dry cleaning/laundry services. A roundtrip airport shuttle is provided for a surcharge (available 24 hours), and free self parking is available onsite. With a stay at RedDoorz @ Kwitang in Jakarta, you'll be within a 10-minute drive of National Monument and Jakarta Cathedral. Free self parking is available onsite. With a stay at Airy Pasteur Dangdeur Indah 20 Bandung in Bandung (Sukajadi), you'll be within a 15-minute drive of Maranatha Christian University and Kartika Sari Dago.